(Photo courtesy of Loop Jamaica). I have to congratulate these young ladies for their impressive finish at the UANA Pan American Synchronized Swimming Championships. Jamaican duet team Nyouka Baugh and Felice Coombs placed fourth in their duet, behind the Mexicans, US and Canada, while Baugh placed fourth in her solo. 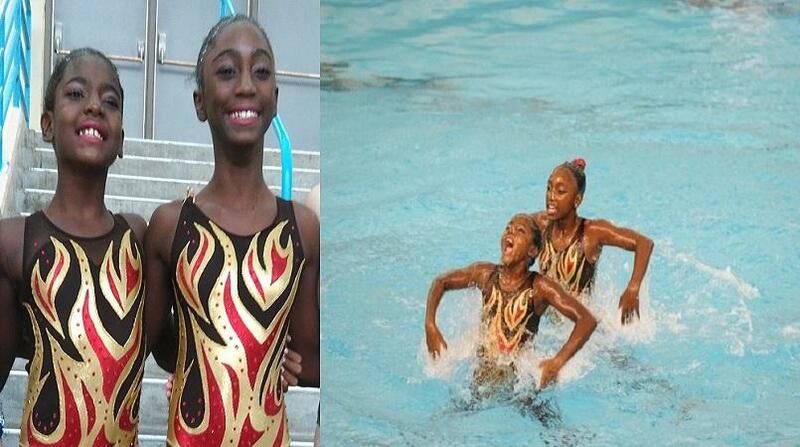 They also recently won gold and silver at the CCCAN Caribbean Regional Championships in July. Having done this sport myself, I know it is no joke. The amount of training and discipline it takes is incredible. They deserve as much recognition (as does Alia Atkinson) as the nation reserves for Bolt and Shelly-Ann etc. Over 200 athletes from 12 countries were in Calgary to compete at the Talisman Centre in the Championships, which is held annually for synchronised swimmers in the region of the Americas. They compete in 12-and-under, 13-15 and 16-18 age groups featuring solo, duet, team and free combination events. The duo was prepared by coach Olga Novokshchnova of Island Aquatics Synchro Club and national coach Jun Tochino, who accompanied the swimmers. They were encouraged by the improved scores compared to the CCCAN, especially since this event was a higher level of competition. They also believe that the swimmers can do even better in the future, especially with improvement in the figures portion of the scores. Amateur Swimming Association of Jamaica, which governs synchronised swimming, wanted to send a larger contingent to the championships, but inadequate funding prevented this.